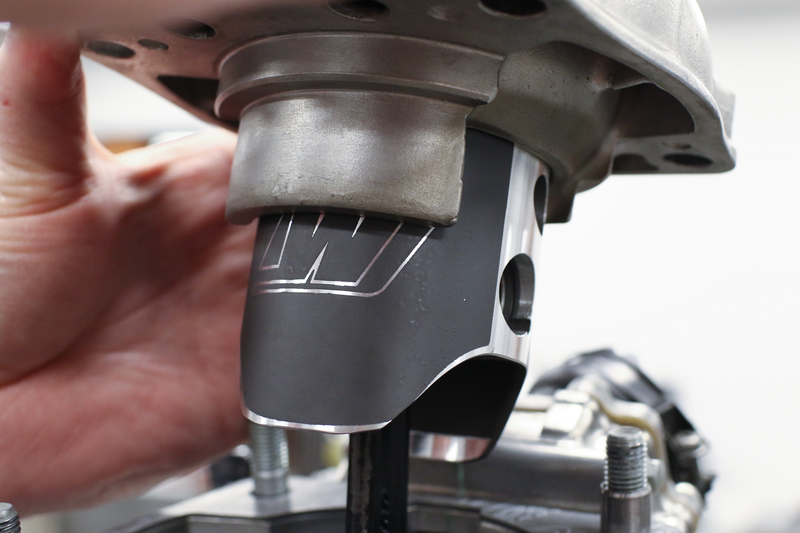 The piston is one of many wear items in your powersports machine. It may last longer than tires or a chain, but it should still be treated as normal maintenance when the time comes. Here, we go through key tips to help you know when it's time for a refresh. The piston in an internal combustion engine is arguably one of the most important components found in the engine. When it comes to high-performance engines used in powersports applications, it is also a component that is regularly replaced and serviced. Knowing when your piston should be replaced and how it wears is key to maintaining a reliable engine. To help you make that decision, we laid out replacement intervals, piston wear, why it’s important to replace the piston, and piston replacement options. Piston replacement intervals are typically outlined in your machine’s factory service manual. Using dirt bikes as an example, many manufacturers outline a piston and ring replacement schedule of every six races or 15-30 hours for a four-stroke, depending on the machine. If you’re new to the sport or have never looked at your factory service manual, these service intervals may seem shockingly short. The service intervals are based on the service schedules required to maintain a high-level racer’s machine. Unfortunately, for the average rider, the outlined service intervals commonly end up being conservative. The recommended piston service intervals outlined in your manual may be shocking, but the actual required service time depends on many variables that differ by each rider. In reality, piston replacement intervals should be established based on how the individual owner rides and maintains their machine. It’s true that forged pistons exhibit greater strength and wear resistance, but the variables of rider and maintenance still apply. Engine displacement, engine make, air filter maintenance, environmental conditions, riding style, and the type of riding the machine is used for will all influence how long the engine should be operated before servicing it. Monitoring the engine’s health through periodic checks such as compression and leak down tests is the best way most riders can appropriately time major service tasks, such as piston and ring replacement. Due to the number of variables that affect engine wear, it is simply not possible to specify a replacement schedule that fits everyone’s needs other than a very conservative schedule. Realistically, there are too many variables to establish an official recommended piston replacement time. Sticking to the short time recommended in the manual can be overkill for some, but keeps things on the safe side. Piston wear will typically occur in four key areas for both two and four-stroke engines, which include the piston skirt, wrist pin bore, ring grooves, and piston crown. The next time you disassemble your top end, keep an eye out for these wear points. 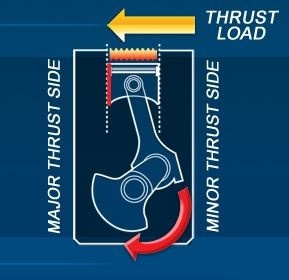 Piston skirts experience load on the major and minor thrust sides, resulting in wear in those areas. Nowadays, on four-stroke engines, the piston skirt is very short and limited to the major and minor thrust faces of the piston. For reference, the thrust faces correspond with the intake and exhaust valve sides of the cylinder head. Two-stroke pistons use the same nomenclature, but feature much longer, more pronounced skirts. Piston skirt wear occurs because of the thrust loading that results from the inherent geometry of the crank mechanism as the engine fires. Peak combustion pressure occurs slightly after top dead center, which causes the piston to thrust into the cylinder wall. Skirt wear can be observed both visually and by measuring the skirt’s diameter and referencing it against the diameter outlined in your service manual. 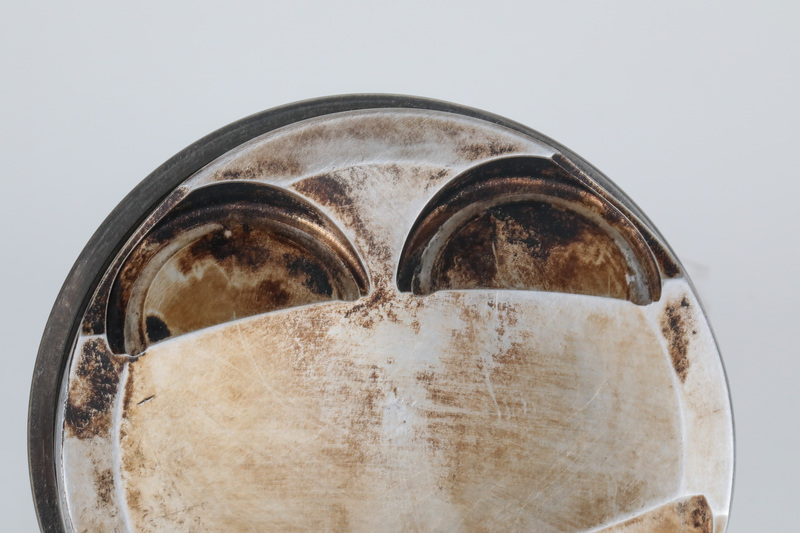 Skirt wear will appear as a polished area on the major and minor thrusting faces of the piston. Notice the polished-looking wear marks on the forged piston on the left, and the vertical wear marks on two-stroke cast piston on the right. These reflect wear after a substantial amount of run time. 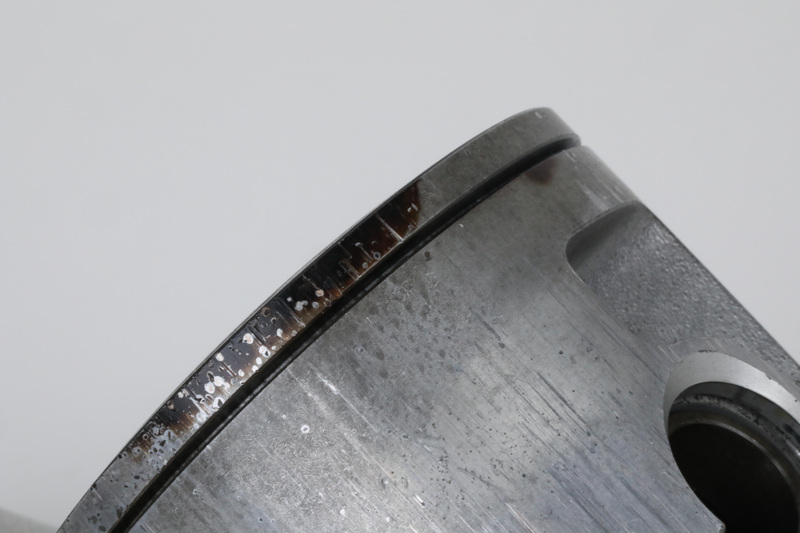 The grooves on the two-stroke piston are a potential sign of dust/dirt in the cylinder. Your pistons may feature one of a few different types of skirt coating. 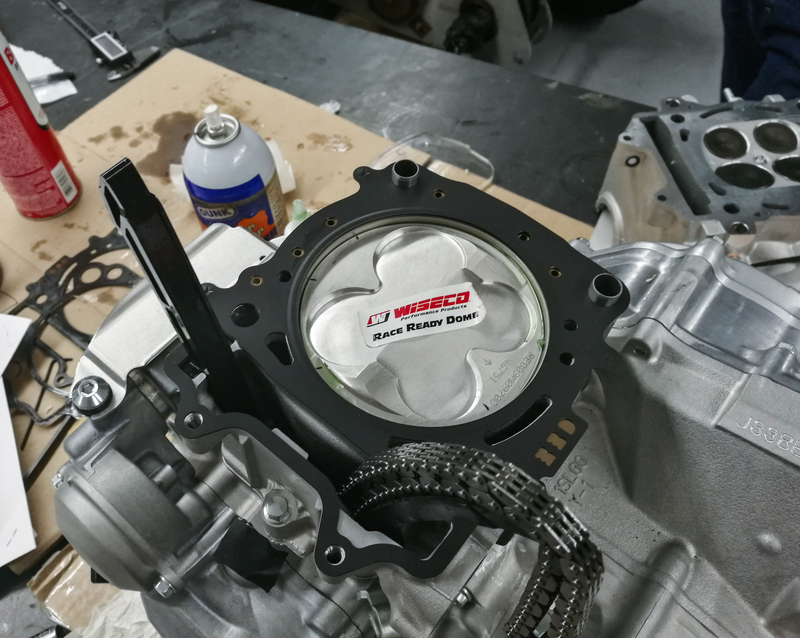 Wiseco pistons utilize different types of skirt coatings depending on the piston, including ArmorGlide and ArmorFit coatings. These coatings are screen printed on and are applied to remain on the skirt for the life of the piston. 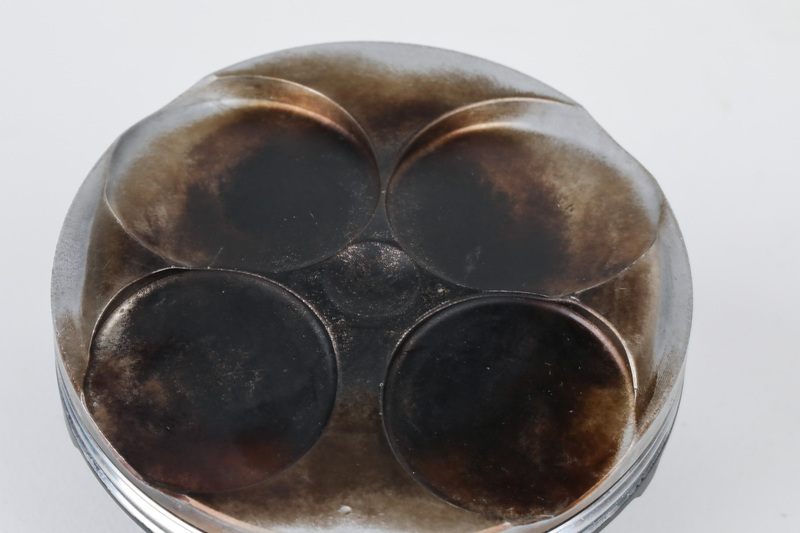 You will likely see some wear on the skirt coating after putting time on your piston(s), but if it is worn all the way through the coating, there’s a good chance there’s an underlying issue that needs investigation. Too little clearance, foreign material in the cylinder, and improper cylinder preparation could be causes of excessive skirt wear. This piston is equipped with ArmorGlide skirt coating. However, the wear patterns are indicative of the possibility of foreign material, such as dirt, making its way into the cylinder. On two-stroke engines, skirt wear can occasionally be heard audibly while the engine is running, which is commonly known as “piston slap”. A rhythmic metallic sound often accompanies a loose or worn piston when the engine idles. What can be heard is the piston rocking back and forth in its bore as it reciprocates. Piston crown wear will occur as a result of aggressive or improper tuning, and on four-stroke engines, a damaged or mis-timed valvetrain. Engines operated with a lean mixture at full throttle will see abnormally high combustion temps, which can cause detonation. 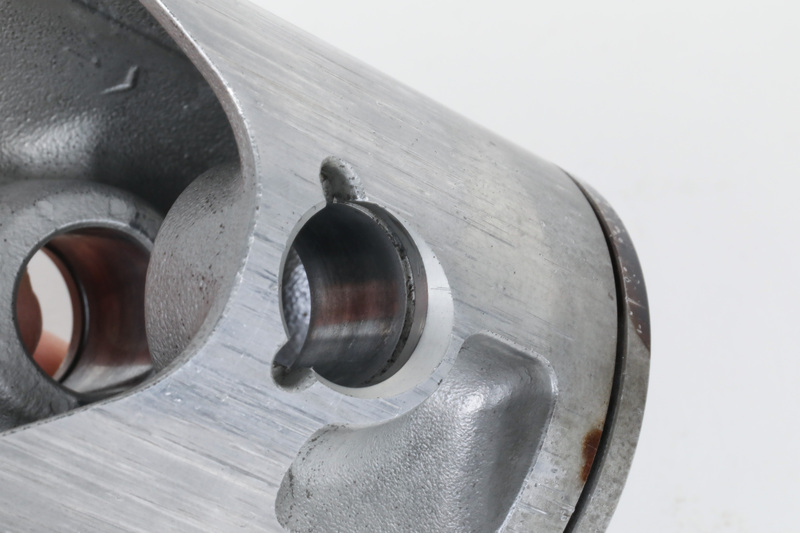 The results of detonation will be visible on the piston crown as a pitted or eroded surface. The pitting in the center is a pretty clear sign of detonation. In many cases, pitting and erosion will be much more evident the leaner the running conditions. Notice the half-circles in the valve reliefs. This is a clear sign of valve contact with the piston. The piston rings move in and out of their grooves because of the ignition of the air/fuel mixture in the combustion chamber. Once the mixture is ignited, the cylinder pressure increases which energizes the compression ring and forces it against the cylinder wall, causing it to slide in its groove. On four-stroke engines, the compression ring will transition from seating on the bottom of the ring groove to the top ring groove at the end of the exhaust stroke due to forces of inertia acting on the ring. Ring movement during operation will eventually wear ring grooves beyond their designed size. Substantial run time can also leave carbon deposits in the ring grooves, affecting ring seal and performance. 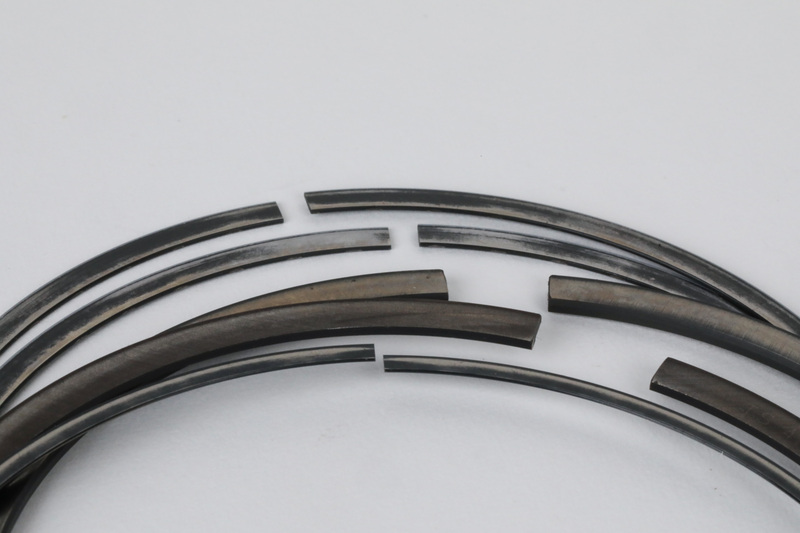 Ring and groove wear can occur due to the sliding and reciprocating motion of the rings and can be exasperated by carbon deposits that accumulate in the ring groove. Ring and groove wear can be qualified by thoroughly cleaning the ring and groove and then measuring each. Most service manuals outline specifications for ring width, groove width, and piston ring to ring groove clearance. 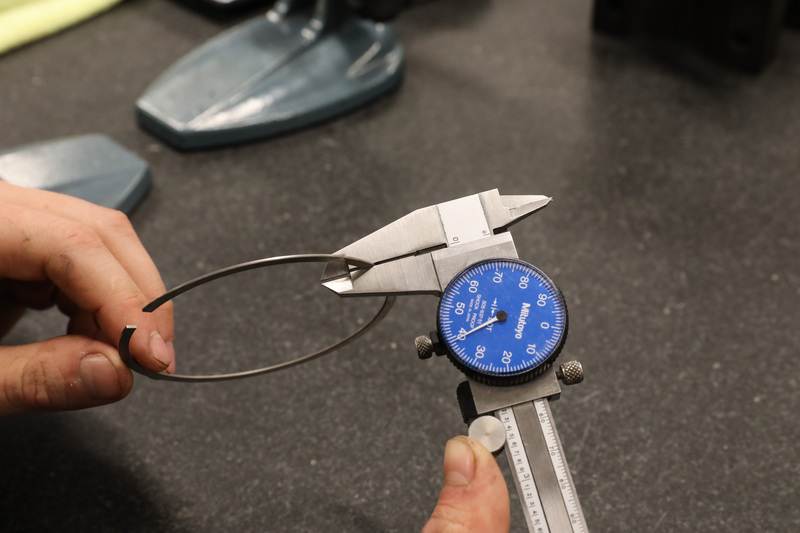 Ring wear can be easily visually observed, but can be confirmed by taking axial height and radial width measurements and comparing them to the original spec. Wrist pin bore wear occurs as a result of the loading of the wrist pin joint through inertia and combustion loading. The wrist pin bore will typically wear into an oblong shape. In some engines, wrist pin bore wear will be visible in the top and bottom of the bore. Usually, a portion of the bore will appear burnished or polished. Alternatively, the wrist pin bore can be measured from top to bottom and from side to side. Both measurements can be compared to one another to determine how much the bore has become out of round and to the diameters specified in the service manual. Wrist pin bores typically wear into a vertical, oval shape due to the pushing and pulling forces of engine operation. Visual inspection can show excessive wear, and a vertical and horizontal diameter measurement can tell you how out of round it is. If it's proving out of round, it's probably time for a replacement. The importance of replacing the piston at regular intervals in high-performance powersports engines cannot be overstated. 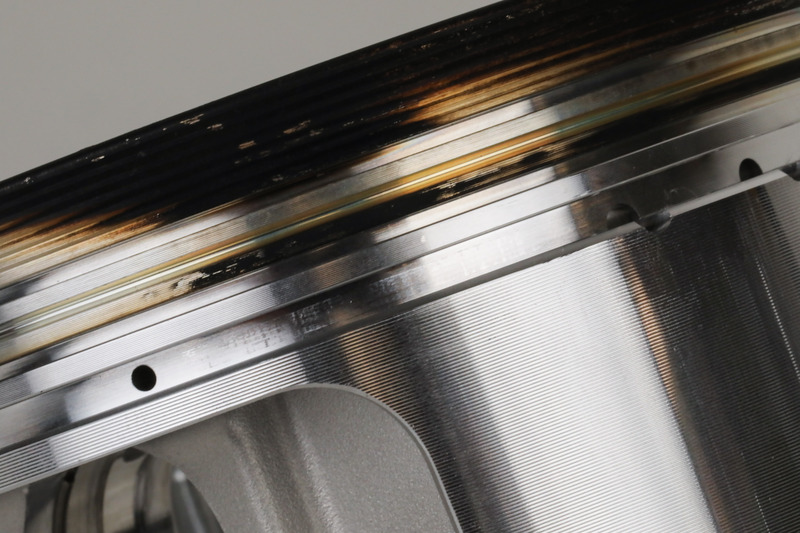 If left unattended, the resulting cumulative wear of the piston will eventually result in a catastrophic and expensive engine failure. Typically, too much time on a piston can lead to gradual and finally complete failure of the skirt in both two and four-stroke engines. Between aftermarket suppliers and OEMs, replacement piston options are plentiful and can be overwhelming. The most common upgrade and consideration most riders are faced with is whether or not to move to a forged piston. Forged pistons can be a nice upgrade for many riders because they can offer additional strength and wear resistance over cast pistons. 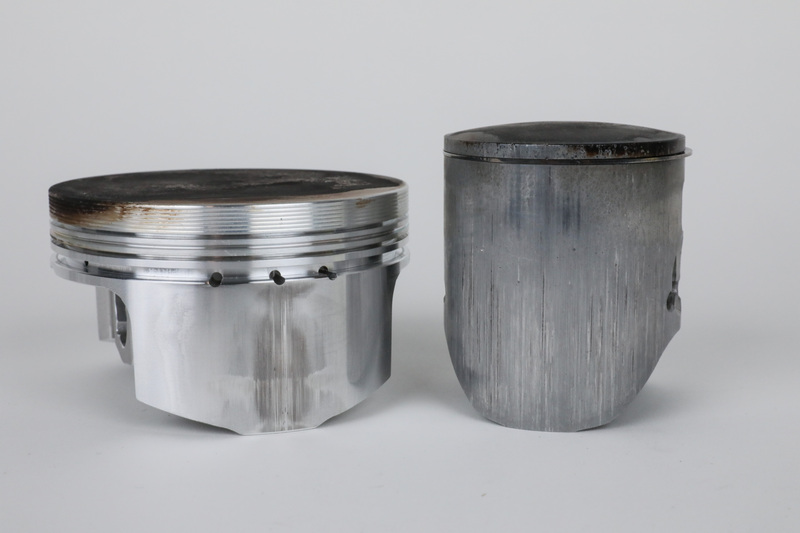 Forged pistons achieve greater strength than cast pistons by using different aluminum alloys and manufacturing processes. The forging process for pistons results in finished components that have a tighter molecular structure and grain flow optimized for strength. Comparatively, cast pistons are not cast under high pressures and have molecular structures that are not as tight or organized, which in severe cases, can lead to voids, inclusions, and air pockets. 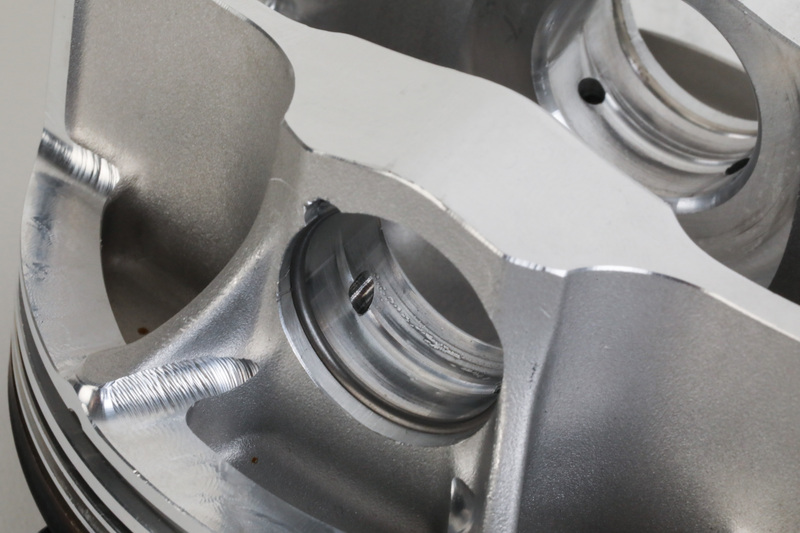 Forging pistons results in a better-aligned grain flow and higher tensile strength. 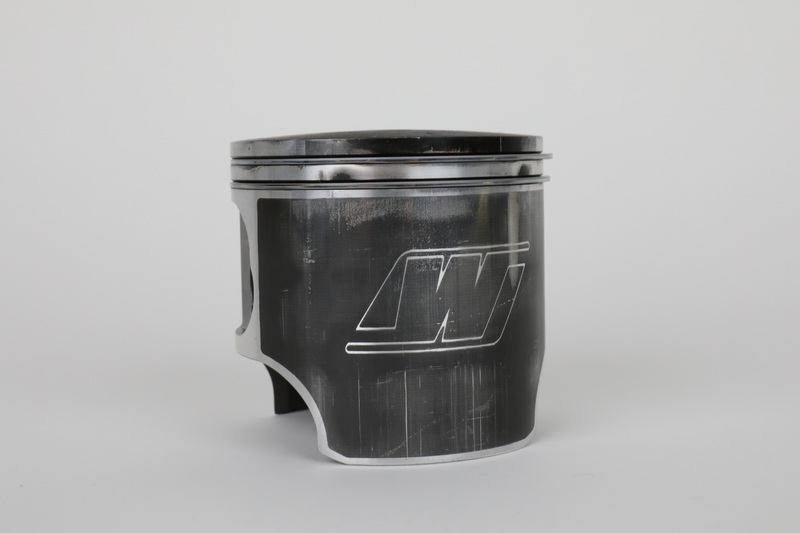 Read more about how Wiseco forges piston here. 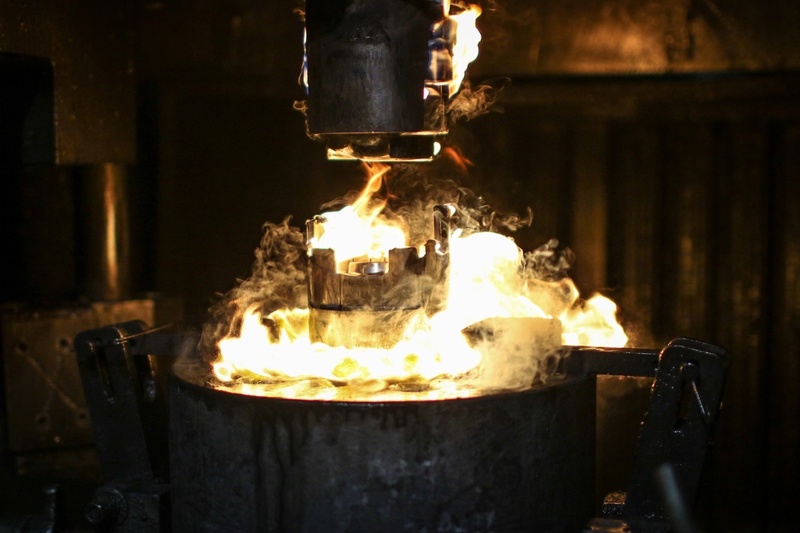 Wiseco has been forging pistons in the U.S. for decades and has spent countless hours on research and development to make their forged pistons the option that best combines performance and wear resistance. Still, there is a lifespan to a piston, and the above tips should be used to practice regular maintenance on your machine.